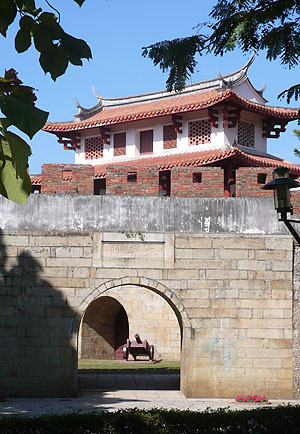 The Great South Gate is the only gate in Tainan with the walls still preserved. Dànánmén, the Great South Gate, is one of only two main gates left from the days when Tainan City was protected by walls. The other remaining gate is Dàdōngmén, the Great East Gate, but it is surrounded by a traffic circle and cannot be interacted with in the same way. There were seven main gates when the city walls were constructed during the Qing era. The Great South Gate was constructed in 1736 with major renovations coming in 1836 and the most recent renovations coming in 1977. The original city walls were changed from wood to cement in 1788. The Great South Gate is located in the Confucius Temple Cultural Zone, just two blocks away from the Confucius Temple. It is surrounded by a lovely city park that makes it look like an old fort in the jungle (and made me miss it entirely the first time I visited Tainan). The walls of the gate are part of the former city walls. 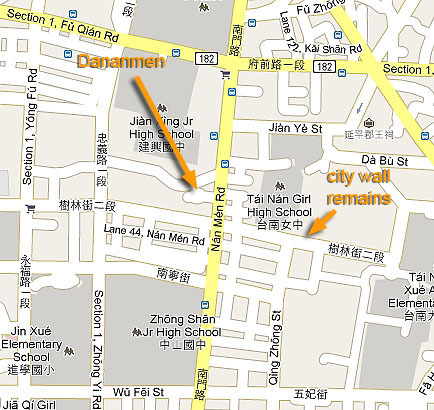 Other sections of the city walls have been restored between the south gate and the east gate, most notably just east of Dànánmén on Shulin Street where a section of the city wall forms part of the curtain wall for Tainan Girls Senior High School. The south gate actually has two different gates. The first gate is on a rounded outer wall leading into a moon-shaped courtyard. This outer section with a courtyard is called a wengcheng and has traditions leading back to the Great Wall of China. It gives an extra outer defence and potentially forces attackers to become sitting ducks inside the courtyard if they manage to get through the first gate. The wengcheng was added to the gate in 1836. Visitors can enter into the courtyard where they can move about the fortifications and climb to the top of the walls to have a look around. The second gate is generally left closed. It is beneath the gatehouse and does not face the first gate directly for strategic purposes. Also inside the park is a collection of steles (tablets) that were removed from various areas around the city by the Japanese. These are all Qing period public notices and mandates carved into stone. The Chinese writing is mostly worn away, but there are descriptions of each stele in Chinese and English. A lot of them are simply construction announcements, but there are some more interesting ones like a decree that you must provide a spouse for your maid when she is between the ages of 23 and 25. Another one says that people who have debt problems should not commit suicide for repudiation. 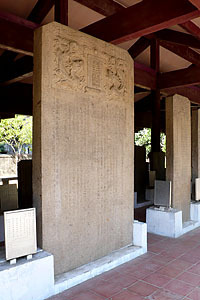 Next to the steles is the tomb of Wu Shan Xin, the businessman and philanthropist who built Wu’s Garden. Both the Great South Gate and the restored city wall on Shulin Street are national third-class historic sites. They have opened a cafe along the walls of the gate and offer entertainment at night. I’m not sure how long this venture will last, but it’s worth checking out and makes a nice pit stop on the waling tour.